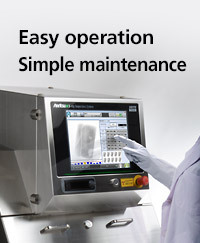 Anritsu X-Ray Inspection Systems give food and pharmaceutical producers the best combination of contaminant detection, reliability, and low total cost of ownership. 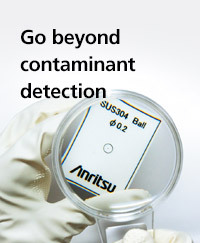 Anritsu has the advanced technology you can trust to protect your customers from even the smallest contaminants. With outstanding accuracy and precision, our x-ray machines can detect metal, stone, bone, glass, and more, using our advanced HD and UltraHD technology. Beyond detection, Anritsu X-Ray Inspection provides missing product, shape detection, virtual weight, count, and package check. Anritsu UltraHD Technology is known for its ability to detect contaminants of only 0.2 mm diameter, including ferrous, non-ferrous, and stainless contaminants. Anritsu HD Systems can detect metal contaminants as small as 0.4mm, and glass and stones at 1.0mm to 2.0 mm. Performance Series Most technologically advanced X-Ray with Long Life technology for a reduced total cost of ownership. Major component lifetime increased by 300%. Lower power consumption. Shape analysis, missing product, and product integrity checks. Suitable for packaged or bulk food. Performance Series The new Side View brings XR75 X-Ray technology and low TCO to rigid package inspection. Applications include PET bottles, standup pouches, vertical cartons and aseptic packaging. Dual Energy Technology DualX technology is unique as it analyzes two X-Ray signals at the same time for a higher detection rate of low-density items, compared to conventional technology. Effectively detects soft contaminants, ideal for bones in poultry/meat and overlapping products, such as harvested products, French fries and chicken nuggets. Economy Series New entry level X-Ray. 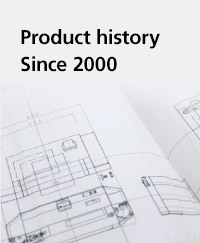 Proven reliability at value price. Fully integrated solution with integrated reject and bin. The new machine conserves space, occupying a 55-inch footprint with integrated reject. Entry level contaminant detection model. Versatility is a defining factor of the Standard High Definition series. Different models are designed to accommodate varying packaged good product sizes for inspection. Detection accuracy and performance stability are inherent within this line of x-ray inspection systems, which also offers the highest resolution x-ray imagery as a standard feature. High Accuracy X-Ray This high sensitivity model has high power and high accuracy for food inspection. Hard and soft contaminants can be detected in packaged products, such as whole cheese, pasta and meat. Pipeline Inspection X-Ray Inspection System This detection technology is suitable for the inspection of fluids and semi-solid products flowing in pipes, such as sauces and fruit preparations. 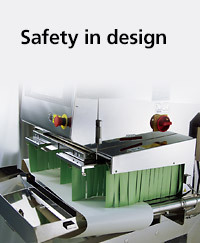 Unlike other inspection systems, this line is meant for unpackaged products only. Easy to clean, other features include a color LED touchscreen, online interface, flow detection change and more. Bulk Fresh Food X-Ray Inspection System Make sure your unpackaged fresh food remains sanitary and at the correct temperature during the x-ray inspection process with a Bulk Fresh Food x-ray inspection system. Quick, efficient and accurate, this system is perfect for inspecting fresh meat, fish and other products that must be screened in a timely manner to preserve product quality. Large Product X-Ray Large Product X-Ray inspection is ideal for detection of lower density contaminants in bulk products. A large aperture infeed system allows for the inspection of large cartons, cases and bags, as well as those containing multiple small packs. IP69K Sanitary The Sanitary Design line-up consists of two models, one for packaged food and the other for unpackaged fresh food. Both models keep food within its appropriate temperature range, because they are equipped with an air conditioner. Designed in accordance with the sanitary guidelines of the American Meat Institute, the machines are easy to clean and maintain.